The Gibson Les Paul Custom was originally designed as a higher end variation of the Gibson Les Paul Standard guitar. It was developed in 1953 after Gibson had introduced the Les Paul model in 1952. The Gibson Les Paul introduced in 1952, was originally made with a mahogany body and a 1″ thick maple cap, mahogany neck with rosewood fret board and two P-90 pickups. The guitar was only available in a gold finish and had a different neck angle and a lare trapeze style tailpiece. In late 1953, a more luxurious version was introduced, on request by Les Paul himself, he wanted a more luxurious and classy looking guitar. He requested a black guitar as he wanted it to “look like a tuxedo”. Nicknamed the Black Beauty, the guitar had a mahogany body and neck, ebony fret board, and mother of pearl block markers inlays in the fret board. The “Split Diamond” inlay on the headstock was taken from the carved archtop Super 400 which was the top of the Gibson line. The pickups were a P-90 in the bridge position and an Alnico V pickup, in the neck position.The frets are low and flat, as opposed to the usual medium jumbo frets found on other Les Paul customs, and the guitar soon was given the nickname “The Fretless Wonder”. The 1954 Les Paul Custom also saw the introduction of Gibson’s new bridge, the ABR-1. 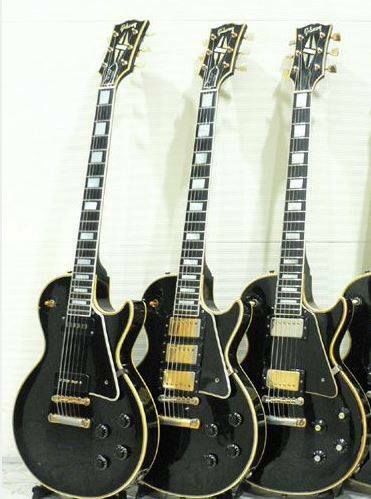 The new Custom also shipped with a different case from the Standard, using a black and gold case instead of the brown and pink case that was the top-of-the-line case for the Les Paul Standard models. This was to be the case until the Custom was replaced and discontinued (though a similar black case was used with the LP/SG Custom models). In mid-1957, Gibson began to equip the Les Paul Custom with the new PAF (Patent Applied For) pickup designed by Seth Lover. Most Customs have three PAFs, though there are a small number that have the traditional two-pickup configuration. By 1958, Gibson had replaced the Kluson tuners with Grover Rotomatics. It is this configuration that remained until the guitar was discontinued in 1960, replaced by the new double cutaway body Les Paul model. There are a small number of 1961 Les Paul Customs that were made with the single cutaway body before the transition to the new, SG-style body was complete. The Les Paul Custom remained a double cutaway model until 1963, when Les Paul’s endorsement with Gibson ended, and the guitar was subsequently renamed the SG Custom. In 1968, Gibson reintroduced the Les Paul Custom as a two pickup model. The headstock angle was changed from 17 degrees to 14, a wider headstock and a maple top (in lieu of the original 1953-1961 mahogany top construction). After 1961 the last three rectangular inlays on the fingerboard changed from uniform in size to the last two inlays that gradually became smaller in size. In 1969, Norlin had acquired Gibson, and the Les Paul Custom saw many changes between 1969 and 2004. The mahogany neck was replaced with a three-piece maple neck in 1975 (though some mahogany ones were still made)with this change lasting till around 1982, and the solid mahogany body was replaced with a “pancake” body in late 1969, where a small strip of maple resides between two thicker pieces of mahogany. This would last until 1977. In 1970, a “Made in USA” stamp was added to the back of the headstock, and a volute was added to help strengthen the headstock.